Fourth Row Center: Film Writings by Jason Bailey: On DVD: "Tangled"
Tangled is the 50th feature-length Disney animated picture, and it wobbles uncertainly on a precipice separating their past and their future. It has the sleek sheen of the computer-generated animation that has made their subsidiary Pixar the gold standard in movie animation; with a couple of exceptions, the look of the film is tremendous. But it attempts to wed this new, modern technique with a decidedly old-fashioned Disney storytelling style, and the mixture doesn’t take. In their attempt to revitalize an aging brand, they’ve gone and updated the wrong stuff. As with so many of their earlier classics, Tangled is based (loosely, anyway) on a classic fairy tale: Rapunzel, she of the endless golden hair. It’s frankly a little shocking that it took Disney this long to get their hands on the tale. Their adaptation casts Rapunzel as the lost, only child of the king and queen, stolen as a baby by the evil witch Gothel (voiced by Donna Murphy) for the healing (and de-aging) powers of her golden locks. We catch up with her as a young woman (Mandy Moore), longing to leave her tower on her birthday to get a closer look at the floating lanterns that are sent up over the kingdom every year (a tribute from her still-heartbroken parents). Gothel will have none of it, but when the charming rogue Flynn Ryder (Zachary Levi) stumbles upon the tower, Rapunzel sees an escape route. What’s more offensive than the punchlines, however, is the film’s insistence on sticking to the same tired Disney formula. We have a spirited princess, a handsome hero, an evil witch, and wacky animal sidekicks, scored with a soundtrack of inoffensive, forgettable lite-pop songs. The music is by long-time Disney favorite Alan Menken, but he’s a long way from The Little Mermaid; these are C-grade show-tunes, not a keeper among them. The most enjoyable is probably the big number in the pub, but it mostly feels like a rehash of “Gaston” from Beauty and the Beast. The picture does have occasional pleasures. Mandy Moore’s take on Rapunzel is chipper and likable; she’s got a disarmingly dizzy presence in the role, even when only contributing her voice. And it looks great—the dam-breaking sequence is stunning, and the long-awaited floating lanterns are luminous. They rise over the kingdom as Flynn and Rapunzel, who are (spoiler, I guess?) falling in love, watch from a boat in the middle of a lake. As the lanterns rise and they sing together, the moment is pure corn and the song is terrible—but it soars just right, and the sequence, admittedly, works. I’m not made of wood, people. 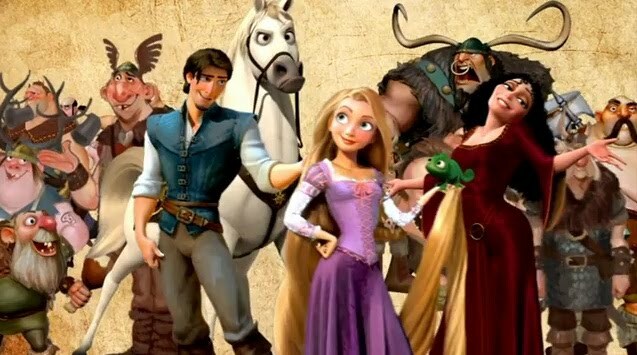 Ultimately, though, Tangled isn’t terribly good Disney—old or new. Pixar mastermind John Lasseter is credited as executive producer, and was reportedly as hands-on here as he is with his own crew. We can presume that he takes some pride in making a Disney movie that looks as good as a Pixar production. Now he just needs to teach them how to fix up a script. "Tangled" is available now on DVD and Blu-ray.